Uncategorized – Ashok N. Srivastava, Ph.D.
I’m very pleased to announce the release of our new book on the applications of machine learning in the Earth Sciences. A Press Release about the new Verizon Labs in Palo Alto. We are hiring! I’ve moved from NASA and am now the Chief Data Scientist at Verizon. I’m starting a new lab in downtown Palo Alto and we are hiring! If you are interested please send me a note. We will be focusing on big data R&D in a number of key verticals. The data sets are massive and the opportunity is immense. 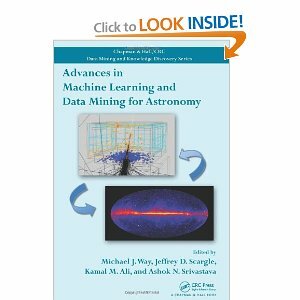 Advances in Machine Learning and Data Mining for Astronomy documents numerous successful collaborations among computer scientists, statisticians, and astronomers who illustrate the application of state-of-the-art machine learning and data mining techniques in astronomy. Due to the massive amount and complexity of data in most scientific disciplines, the material discussed in this text transcends traditional boundaries between various areas in the sciences and computer science. The book’s introductory part provides context to issues in the astronomical sciences that are also important to health, social, and physical sciences, particularly with contributions from leading astronomers and computer scientists, this book is a practical guide to many of the most important developments in machine learning, data mining, and statistics. It explores how these advances can solve current and future problems in astronomy and looks at how they could lead to the creation of entirely new algorithms within the data mining community. Probabilistic and statistical aspects of classification and cluster analysis. The next part describes a number of astrophysics case studies that leverage a range of machine learning and data mining technologies. In the last part, developers of algorithms and practitioners of machine learning and data mining show how these tools and techniques are used in astronomical applications. 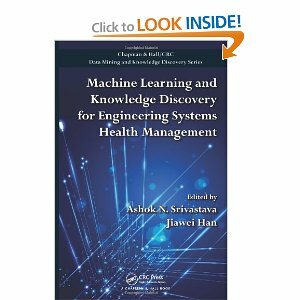 Machine Learning and Knowledge Discovery for Engineering Systems Health Management presents state-of-the-art tools and techniques for automatically detecting, diagnosing, and predicting the effects of adverse events in an engineered system. With contributions from many top authorities on the subject, this volume is the first to bring together the two areas of machine learning and systems health management. Divided into three parts, the book explains how the fundamental algorithms and methods of both physics-based and data-driven approaches effectively address systems health management. The first part of the text describes data-driven methods for anomaly detection, diagnosis, and prognosis of massive data streams and associated performance metrics. It also illustrates the analysis of text reports using novel machine learning approaches that help detect and discriminate between failure modes. The second part focuses on physics-based methods for diagnostics and prognostics, exploring how these methods adapt to observed data. It covers physics-based, data-driven, and hybrid approaches to studying damage propagation and prognostics in composite materials and solid rocket motors. The third part discusses the use of machine learning and physics-based approaches in distributed data centers, aircraft engines, and embedded real-time software systems. Reflecting the interdisciplinary nature of the field, this book shows how various machine learning and knowledge discovery techniques are used in the analysis of complex engineering systems. It emphasizes the importance of these techniques in managing the intricate interactions within and between the systems to maintain a high degree of reliability.